This costume of what must be* Savage Dragon crossplay was spotted at Dragon*Con. * It must be, because the lack of imagination behind “Green Goth Girl” would leave a stain of indelible insult upon this blog. And we all know that every insult on this blog is fully delible. Maybe she’s an alien/human offspring from the Sims? 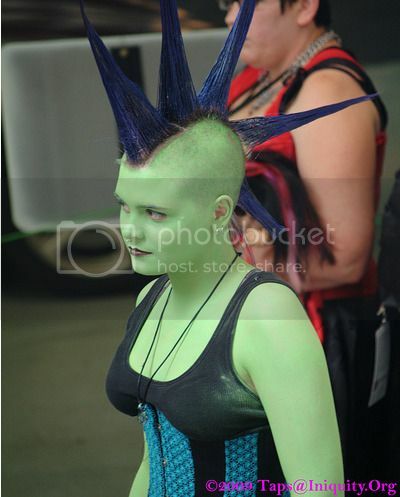 She is the right color, and they can have mohawks. Oh, oops, except for the fact that it was at DRAGON-con. Actually, she was an ork. I know, for she is my spawn.